This image appears in AMPHIBIOUS OPERATIONS, Capture of Iwo Jima 16 February to 16 March 1945, a publication “under the cognizance of, and...distributed by the Commander in Chief, United States Fleet.” The publication was secret, at the time of its release in 1945, and contained these additional instructions: “When no longer required it shall be destroyed by burning. No report of destruction need be submitted.” The image, which appears in Chapter 5, depicts U.S. Navy ships at Iwo Jim and “Initial Waves Approaching Southeastern Beaches--Note Preinvasion Bombardment, D-Day (H-Hour-minus).” Online via ibiblio, University of North Carolina at Chapel Hill. 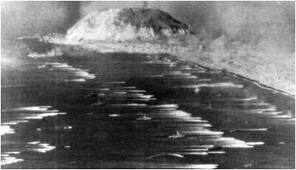 An armada of 880 American ships sailed to Iwo Jima. Aboard some of the vessels were thousands of amphibious-landing Marines. Operated by Navy and Coast Guard men, the ships also carried weapons, ammunition, tanks, supplies and American flags. A request for the Navy to fire its big surface-ship guns at Iwo, for at least four days before the Marines landed, was denied. (In the documents, "Dog" refers to D-Day; "Workman" refers to Iwo Jima.) Admiral Spruance believed the island had to be taken by assault but gave permission for three days of surface-ship firing. Bad weather interfered with those instructions, effectively limiting big-gun pounding to less than three days. Marines would be brought ashore by LSMs (Landing Ships, Medium), which could also carry five Sherman tanks, and LVTs (Tracked Landing Vehicles). At least for the Iwo attack, Marines would not have to board their landing craft by first dropping down the sides of transport vessels on nets - doing their best to keep the contents of their stomachs inside their bodies. Iwo is a small island with few, if any, good places to unload and store supplies. At the time, it did not have existing roads - or easy access. Sherman tanks and amphibious tractors (dubbed “Amtracs”) would have trouble moving through the soft volcanic ash. To scale Suribachi, Marines would have to inch their way to the top. To advance from the beaches to the island’s interior, troops would need bulldozers to clear the way. Before any progress could be made, however, the Marines would have to face - and overcome - Iwo Jima’s incredible defenses. "Portrait of Artist as a Young Man," by Col. Charles H. Waterhouse. 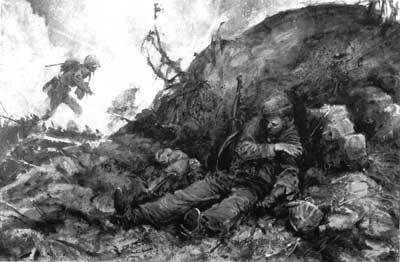 U.S. Marine Corps Art Collection. Image depicts D-Day +2. Bos, Carole "THE ARMADA ARRIVES" AwesomeStories.com. Oct 01, 2006. Apr 26, 2019.